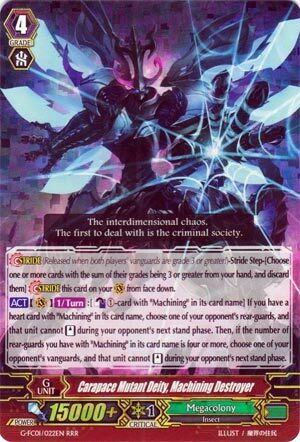 [Stride] (Released when both players’ vanguards are grade 3 or greater! )-Stride Step-[Choose one or more cards with the sum of their grades being 3 or greater from your hand, and discard them] Stride this card on your (VC) from face down. [ACT](VC)[1/Turn]:[Counter Blast (1)-card with “Machining” in its card name] If you have a heart card with “Machining” in its card name, choose one of your opponent’s rear-guards, and that unit cannot [Stand] during your opponent’s next stand phase. Then, if the number of rear-guards you have with “Machining” in its card name is four or more, choose one of your opponent’s vanguards, and that unit cannot [Stand] during your opponent’s next stand phase. Had to pick this one due to V Series Stag Beetle making this much more fun. Now of course I wouldn’t rate Machining as an all-time great in Premium, considering it still needs the old low-shield, 5k power granting triggers for consistency but paralyzing the Vanguard is still a decent strategy in its own right, considering not even Tarna can fix it since Alfred still needs to be standing to Superior Ride.